About me Hello Dear Friends! 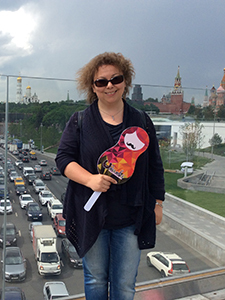 My name is Svetlana Podorogina, I am a Moscow tour guide and coordinator, licensed with the Russian Association of tour guides and tour managers. I speak English and run private tours to Moscow, interpret and support sales at exhibitions and trade shows, arrange and coordinate business visits to the city. My prices are also valid for tours guided in French, Spanish, German, Italian. For years I have been working in close cooperation with my colleagues speaking different languages including Mandarin, Hebrew, Korean, Japanese. As a tour coordinator, I tailor each program to my guests' individual pace and preferences before entrusting it to best guides, drivers and other service providers. Well, let us take a drive through the city of "two sidedness, complexity, intense movement, collisions and confusion in outward appearance" ! (V. Kandinsky). Have a great journey! Once a residence of Russian tsars and top archbishops, Moscow Kremlin plunges guests into breath-taking history of Russia's statehood and Orthodoxy. Apart from walk around the grounds, tour includes visit to magnificent cathedrals, to Armory Chamber housing royal treasures and, last but not least, to Diamond Fund with a unique collection of Russian crown jewels. Prices include: hotel pick-up and drop-off, private licensed guide, guided tour to Kremlin and Armory, Diamond Fund tickets (tour with audioguide). 3 hour driving city tour with major sights and photo stops covers Red Square, Bolshoi Theater, KGB's, Christ the Saviour Cathedral (inside), Duma, Novodevichy Convent, Moscow University and scenic lookout point at Sparrow Hills, Victory Park, Stalin's "Seven Sisters" skyscrapers, Tverskaya Avenue, boulevards. No true impression of a huge city can be gained without a drive through it! Prices include: hotel pick-up and drop-off, private licensed guide, vehicle, parking fees. If you have only one day to explore the city, this is what may suit you best. I pick you up from hotel or from train terminal, and first we take a driving sightseeing tour and visit Red Square. After a lunch break you are invited into the Kremlin, actual residence of Russian president. You walk around the grounds and visit fabulous cathedrals of the Tsars. Short metro ride let you see some of the most famous underground stations. Prices include: hotel pick-up and drop-off, private licensed guide, full time vehicle, admission to Kremlin, metro tickets, bottle of water. The town of Sergiev Posad located 70 miles northward of Moscow is famous for the most sacred and largest monastery, St. Sergius Holy Trinity Lavra. The monastery was founded in the mid-14th century and actual brotherhood is close to 300 monks. Declared a World Heritage Site by UNESCO, it's a true citadel of harmony and beauty. Drive to Sergiev Posad is about 1-1.5 hour one way. The tour gives a chance to visit Russian countryside. Prices include: hotel pick-up and drop-off, full time private licensed guide, full time vehicle, entrance tickets and excursion fee to Holy Trinity Lavra. 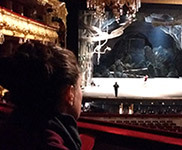 1.5 - 2 hour private tour inside iconic opera and ballet house of Russia. Visitors are usually invited to Imperial ballrooms, lobbies, new rehearsal stage, Beethoven's underground hall-transformer, sometimes to costume-making workshop and, no doubts, to grand auditorium with historic stage where Peter Tchaikovsky's Swan Lake was performed for the first time in 1877. Prices include: hotel pick-up and drop-off, private licensed guide, excursion fee to Bolshoi Theater, photo fees. Pls be aware, tours are not held in the period from July 15 to Sept 11. We start at 8. 30 and take metro to train station for 1. 45 h travel by comfortable Lastochka train from Moscow to Vladimir. Upon arrival at 11.15 we meet our driver and move to Suzdal, tiny town nicely located in the meadows. Local guide is there to join us for visiting Suzdal Kremlin, Wooden Architecture Museum and listening the bells of the St. Euthymius's. After lunch break we drive back to Vladimir to see Golden Gate, elaborately carved St. Dmitry's and the golden-domed Assumption Cathedral holding many memories of Russian Great Princes in the olden days. At 20.15 we take a train back to Moscow. Prices include: hotel pick-up and drop-off, full time private guide to accompany you on trip, service of Vladimir museum guide on spot, official excursion fee, museum fees, train tickets, comfortable A\C car in Suzdal and Vladimir, metro tickets. Before we "set for a space mission", I will take you underground to show the most beautiful metro stations. The Space Museum should not be missed by the interested in history of space exploration. Space dogs, original spacecraft, life-size model of the Mir space station are among the highlights! After we finish the tour, don't miss a chance to explore on your own the VDNKh Park in 5 min walk from the museum. The park has everything to enjoy at any time of the year: fountains and bike rides in summer, huge skating rink in winter and Oceanarium all year around! Prices include: hotel pick-up and drop-off, private licensed guide, entrance tickets and excursion fee to Space Museum, metro tickets. Today's Jewish community unites hundreds of thousands of Moscow Jews and lives intensive cultural, religious and business life. 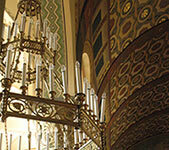 During the tour you visit Grand Choral Synagogue, Chabad Center and Jewish Museum & Tolerance Center, probably the largest interactive Jewish museum in the world telling us wonderful and tragic stories of Russian Jews. If guests wish, they can have a lunch break in a kosher restaurant. Prices include: hotel pick-up and drop-off, private licensed guide, vehicle, entrance tickets and excursion fee to Jewish Museum and Tolerance Center. Kolomenskoye is a former summer residence of Russian tsars in a lovely parkland away from the busy downtown. Guests are guided through endless living and reception chambers of tsar Alexei Mikhailovitch in his palace entirely built of wood and then take a ride in electric car to visit the grounds and 16th century Church of Ascention, UNESCO Heritage Site. Prices include: hotel pick-up and drop-off, private licensed guide, admission to Palace of Alexei Mikhailovitch and Ascention Church, electric car ride, metro tickets. Two day trip to beautiful Russian province starts at 9 am when you meet your guide at hotel and take a drive to Sergiev Posad to visit St. Sergius Holy Trinity Lavra. Next destination is Suzdal, lovely town 260 km away from Moscow. Wooden Architecture Museum is to be visited before you check in at local hotel for overnight. Next morning you check out and continue sightseeing. Suzdal Kremlin, St. Euphymius's bells, Vladimir Assumption Cathedral, lime-stoned carving of St. Dmitry's and panoramic points won't be missed. About 6pm you start moving back to Moscow and finish your trip around 10.30 pm. Prices include: hotel pick-up and drop-off, full time private licensed guide from Vladimir, full time vehicle, admission to Holy Trinity Lavra in Sergiev Posad, admission and excursion fee to Suzdal and Vladimir museums. What's extra: accommodation in Suzdal hotel (prices range from 50 to 100 USD per night), meals and drinks. I was born in Moscow and hold MD in psychology from Moscow State University of Psychology and Education. In the 1990s I moved towards my cherished dream to see the world and started working in tourism industry. Worked as overseas rep in Egypt, France, Cyprus, China, Maldives; headed Russian overseas representative office in India. Was a tourleader leading Russian groups to Europe. Later I completed a demanding academic course for official Moscow tour guide. Apart from my job as a tour guide, I do some psychological research, study history of arts, enjoy travelling, trekking, cycling. I am happy to share my knowledge with you.